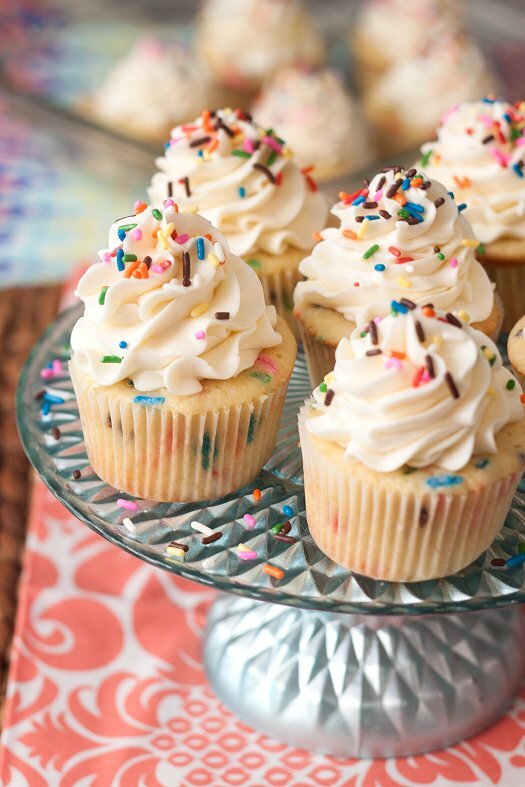 Who doesn’t love Funfetti cupcakes? They’ve long been one of my favorites, and my boneheaded self bought the boxed version for far too long – unable to unlock the mystery of the Funfettiness. Turns out it’s just sprinkles. Or Jimmies. Or whatever you call them in your neck of the woods. So I used my favorite vanilla cupcake recipe, mixed in a handful of multi-colored sprinkles, and baked. Voila! I had homemade Funfetti cupcakes. I’ve made them as the base for several batches of birthday cupcakes now – and everyone always loves them. They are colorful and delicious, and it’s always a comfort to know exactly what’s going into them -versus the boxed stuff, with an ingredient list a mile long and ingredients you can’t even pronounce. Make these for your next celebration (or just because! ), you’re guaranteed to have smiles all around. In a medium mixing bowl, combine the flour, baking powder and salt. Whisk together and set aside. Add the butter to the bowl of an electric mixer fitted with the paddle attachment. Beat on medium-high speed for 2 minutes, until light and creamy in color. Add in the sugar, and beat for 2 minutes more. Scrape down the sides of the bowl and beat for one more minute. Mix in the eggs one at a time until incorporated. Scrape down the sides of the bowl after each addition. Combine the buttermilk and the vanilla extract in a liquid measuring cup. With the mixer on low speed, add the dry ingredients alternately with the wet ingredients, beginning and ending with the dry ingredients and mixing just until incorporated. Scrape down the sides of the bowl and mix for 15 seconds longer. Fold in the sprinkles. Divide the batter between the prepared paper liners, filling each about 2/3 of the way full (you will likely have batter left over after filling 24 wells.) Bake 18-22 minutes, or until a toothpick inserted in the center comes out clean. Allow to cool in the pans 5-10 minutes, then transfer to a cooling rack to cool completely. Replace paper liners and bake remaining batter if desired. Frost cooled cupcakes as desired. Garnish with additional sprinkles before serving. such fun and yummy cupcakes!